Thank your party guests for FLYING BY with these printable favor tags! High-resolution 3.5"x2" files will be available for you to download moments after your payment clears. Simply print, cut out and attach to your favors! Your files will look EXACTLY LIKE the sample (without the watermark). * This listing is for a DIGITAL COPY of this design. This means that no physical product will be mailed to you. Instead, files will be e-mailed to you, for you to print yourself. ► Step 1: Add to your cart. ► Step 3: Once check-out is complete, hover over "Your Account" at the top right corner, then click "Purchases & Reviews". From here, you will be able to download your files. You will also receive an e-mail from Etsy where you can download your files by selecting the "View your Files on Etsy" button. Get 10% off your order when you buy 3 items at this shop. Discount shown at checkout. Very Hungry Caterpillar Food Tents - INSTANT DOWNLOAD - Printable 3.75"x5" Birthday Party Food Signs - Tags for Each Food Caterpillar Ate! 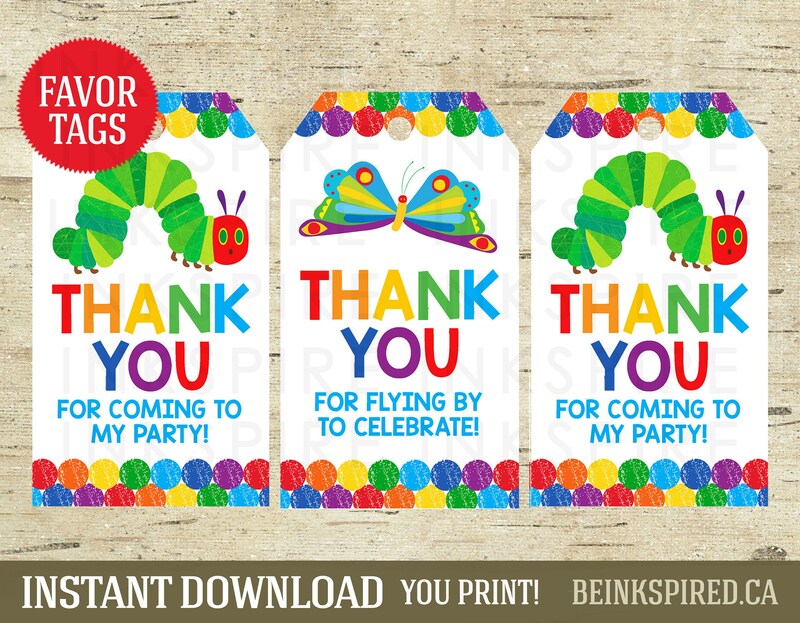 Very Hungry Caterpillar Favor Tag - INSTANT DOWNLOAD - Printable Caterpillar Thank You Tags - 3 Styles! 3.5"x3.5" and 3"x3"
Very Hungry Caterpillar Thank You Card - Printable DIGITAL FILE - Personalized Caterpillar First Birthday Thanks Card - Add a Photo! Personalized Very Hungry Caterpillar Favor Tag - DIGITAL FILE - Printable 3.5"x2" Thank You Tags - Change the Child's Name! Mustache Favor Tags - INSTANT DOWNLOAD - Printable Little Man Gold Glitter Birthday Party Favor Tag - Two Styles! 3.5"x3.5" & 3"x3"
Personalized Construction Favor Tag - DIGITAL FILE - Printable Dump Truck Thank You Tags - Change the Name! Available quickly for download after purchase! Great quality! Available quickly for download after purchase. Great quality! Awesome! Fast! Professional! Courteous! Flexible! Responsive! Will you print for me? At this time I do not offer printing services. I can recommend where you go and what types of paper to use though. Unfortunately I no longer have the time to take on custom orders. Can I print more than one copy? Yes, you can print as many copies of your files as you'd like. Personalized Wild One Favor Tag - DIGITAL FILE - Printable 3.5"x2" Pink Mint & Gold Glitter Tribal Thank You Tags - Change the Child's Name!